“Kukryniksy” was a collective name derived from the combined names of three caricaturists (Mikhail Kupriyanov, Михаил Васильевич Куприянов), Porfiri Krylov (Порфирий Никитич Крылов), and Nikolai Sokolov (Николай Александрович Соколов) who had met at VKhUTEMAS, a Moscow art school, in the early 1920s. The three began drawing caricatures under the joint signature in 1924. They became nationally famous in the 1930s after the rise of fascism, drawing for Krokodil, the Moscow satirical paper. They received international recognition for their attacks on Adolf Hitler, Benito Mussolini, Heinrich Himmler, Joseph Goebbels, and Francisco Franco. 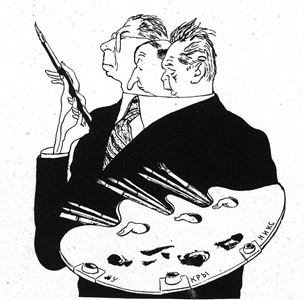 During the second world war they established the TASS Windows for political cartoons and posters. The Kukrynuksy are also authors of Socialist Realism-style paintings concerned with historical, political and propaganda topics. As individuals, they are also known as landscape and portrait artists. All three were awarded the honorary title of People’s Artist of the USSR (1958). They were also recipients of other awards.